We are now at the World Forestry Congress (WFC) in Durban, South Africa to share the story of RESTORASI EKOSISTEM RIAU (RER). RER is a project established by APRIL Group in 2013 to protect and restore important peatland areas on the Kampar Peninsula in Riau, Indonesia. It’s a multi-year collaborative project with partners Fauna & Flora International (FFI), local social NGO Bidara as well as community groups to protect and restore 70,000 hectares of degraded forest under eco-restoration licenses granted by the Indonesian Government. In sharing our story, we’re focusing on three key aspects: why we invest in landscape restoration, the role of plantation forests in sustainable development and why collaboration with the community is so important to the success of projects like this. 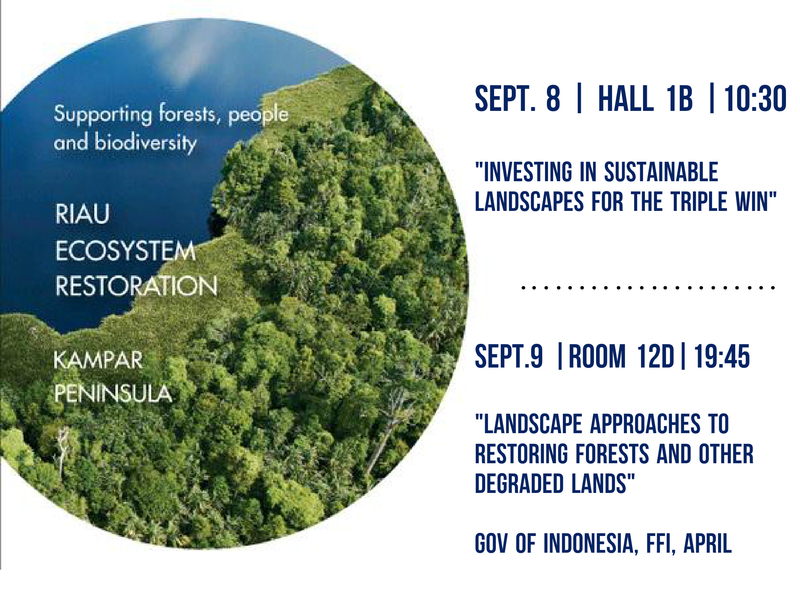 RER incorporates the lessons we’ve learned over the past decade about what works and doesn’t work in conserving natural forest in Indonesia. It’s important because the Kampar Peninsula is a special place and is one of the largest peatland areas in Southeast Asia. Kampar’s tropical forests are rich in biodiversity and support endangered wildlife species, including the Sumatran tiger, flat-headed cat and sun bear. RER is part of a long-term investment by APRIL in sustainable forestry and landscape level conservation with a model of protection, assessment, restoration and management. The community is a key element, recognizing that our plantations can only operate sustainably as part of an integrated approach that takes into account the whole landscape from people to wildlife to ecology. We are making progress but also continue to learn as we go. A landscape’s needs don’t always follow lines on a map and finding a point of equilibrium is an ongoing challenge, reinforcing the need for community engagement. To work, it must be a long-term collaborative process, bringing together diverse stakeholders aiming to achieve a balance between multiple and sometimes conflicting objectives. We look forward to sharing our progress over the next two days and listening to the thoughts and ideas of the global sustainable forestry community.